Men's Wearhouse has launched a hostile bid for rival Jos. A. Bank. Men's Wearhouse has made the latest move in its ongoing battle with Jos. A. Bank. On Monday, Men's Wearhouse launched a hostile bid, making a $1.6 billion cash offer and notifying Jos. A. Bank that it will nominate two members for its board of directors. Jos. A. 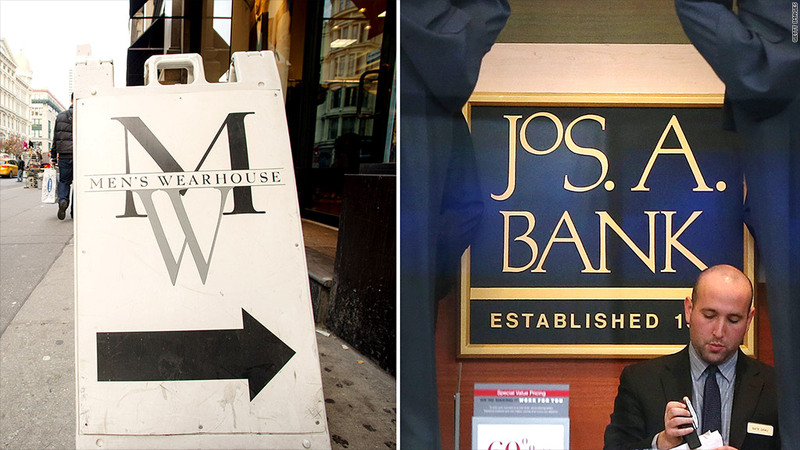 Bank made an offer to buy Men's Wearhouse for $2.4 billion last year. Men's Wearhouse rejected that bid and made an unsolicited bid of $55 a share for Jos. A. Bank -- a bid that was rejected. Monday's offer by Men's Wearhouse would pay shareholders $57.50 per share, a premium of 6% from Friday's closing price for Jos. A. Bank (JOSB). Shares of both companies were up 5% in premarket trading on the news. "Although we have made clear our strong preference to work collaboratively with Jos. A. Bank to realize the benefits of this transaction, we are committed to this combination and, accordingly, we are taking our offer directly to shareholders," Men's Wearhouse (MW) CEO Doug Ewert said in a statement. A spokesman for Jos. A. Bank said the company did not have any immediate response. The company previously said it believed the earlier $55 per share offer "significantly undervalued the company." The hostile bid is not a surprise. On Friday, Jos. A. Bank announced a shareholders' rights plan, commonly known as a poison pill defense, to block a hostile bid by granting additional shares should any buyer acquire 10% of its shares. It has been a bruising six months inside the board room at Men's Wearhouse. Last June, Men's Wearhouse announced the firing of George Zimmer, its chairman, founder, largest individual shareholder and long-time pitchman. Men's Wearhouse is under pressure from its largest shareholder, Eminence Capital, to push for a deal.